Every two years, NCHN conducts a Salary and Benefit Survey of Health Network Leaders. The Board of Directors and members of the Program Development Committee thank the forty-one (41) NCHN members that have completed the 2010 Salary and Benefits Survey. In 2008, thirty-seven (37) members complete the survey. This is the only survey of its kind that specifically targets health network leaders. Several NCHN members have been very successful over the years in using the survey results to negotiate their compensation packages. The 2010 Salary and Benefit Survey Report will be ready for distribution in a couple of weeks. NCHN members that participated in the survey will receive a free copy of the report. The survey is much stronger and more beneficial when a majority of the members participate in the survey. Even, if you do not think you will utilize the results, you can support your peers with your participation. The survey should be completed by the person that is the leader of the network, e.g., Executive Director, President, Chief Executive Office, Coordinator, etc. If you are a NCHN member and did not participate in the survey, there are still a few days to do so. Please email rdavis@nchn.org and request survey details and the link to access the survey. Thank you for your assistance with this important NCHN project and member benefit. Candidate for a Director position must have served at least two (2) years on NCHN committee(s). Last Call for 2010 Committee Members! NCHN is a membership organization and is directed by the membership. The Association's government structure consists of a Board of Directors, Executive Committee and other committees as needed. We have a number of committees that operate to assist the Association in meeting its mission. One way to become involved in the governance of the Association is through committee work. If you have an interest in serving on the NCHN Board of Directors in the future, please become involved with committee work in 2010! There is also a description of the work each committee is charged to perform. Please review the list of committees and complete the committee sign-up form included with the descriptions. If you served on a committee in 2009 and would like to remain on the committee, please complete the survey. Also, if you attended the 2010 Annual Conference in San Antonio and signed up for a committee at the Annual Membership Meeting, please confirm your continued interest in that committee by completing the survey. Committees are beginning to meet. Last year NCHN negotiated a super rate for member access to the GrantStation program and was also able to extend the rate to members of NCHN members. This is the most accessed program of all of NCHN’s partners! Over 100 organizations subscribed, saving thousands of dollars. 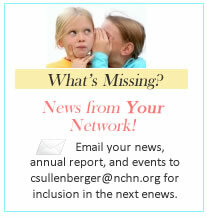 NCHN is now in the process of renewing subscriptions for 2010. If your membership is expiring currently (May 15-June 18), you should have received an email notifying you that it is time to renew. Organizations with expiration dates of July 1 - September 30 will should receive renewal notices in June. The yearly rate is the same, $50 per subscription (normal price is $599/year) and you may once again extend the services to your network members. However, this year for billing purposes, NCHN will need to invoice the network for all renewal or new subscriptions, instead of invoicing the individual organization. This turned into an extended bookkeeping project for our contracted accounting services and will be easier to manage if we only have invoices going to our members. All subscriptions were received from networks, so you should have a copy of the sign-up sheet for the members of your network that subscribed. If you have questions about subscriptions for your network and members, please contact Rebecca Davis. For those of you that may not have participated in the GrantStation program, information is included below. If desired, NCHN can set up a conference call with GrantStation personnel to demonstrate the program and discuss services. GrantStation is an interactive website that allows grantseekers to identify potential funding sources for their programs or projects, and mentors them through the grantseeking process. GrantStation provides access to a searchable database of grantmakers who are actively accepting inquiries and proposals from a variety of organizations; federal grant deadlines, which are updated twice a week; links to state funding agencies; and a growing database of international grantmakers. NCHN will submit all the participating members to GrantStation, pay the subscription fee and then invoice the network for all subscriptions at the rate of $50/subscription.You can sign up for two years at this time. If you have questions about the program and/or would like to participate or extend the services to your network members, Rebecca Davis. Send in your network's story today for inclusion in the NCHN Success Stories booklet and the RAC website. Stories range in topics from successful collaborations to start-up projects. Even if your story is not about your success, you can share information about what you would do differently. The only objective is to educate other organizations by sharing what your network is doing. NCHN has a new discussion board where you can post questions, comments, and pose discussions. This was created for you. The General Discussion area is open for public viewing and posting by non-members. However, there is also an NCHN Members-only area that is only accessible (readable or writeable) by NCHN members. This section requires that we validate your membership. While we review the forum member logs periodically, if you want immediate access, just send an email to csullenberger@nchn.org and we will have you validated asap. To register, go to http://z7.invisionfree.com/NCHN/index.php and click on "Register." Rebecca J. Davis, Ph.D., Executive Director of NCHN was recently elected to serve a three-year term on the Breckinridge County Chamber of Commerce. She will be inducted at the Chamber of Commerce Annual Dinner on June 15 in Harned, Kentucky. NCHN has been a member of the Chamber since 2007. NCHN was the sponsor of the Chamber's March 16th breakfast and was featured in their April 2010 newsletter (pdf). Established in 1935, The Hylant Group has grown to over 600 industry professionals now ranked as the 25th largest firm Nationally (2009 Business Insurance Magazine). For 75 years the Hylant Group has remained privately owned and operated. Our continued focus on driving bottom line value and understanding hospitals unique needs is the key to our success throughout the U.S. We continue to invest in our most valuable assets our service team and our clients. Hylant provides insurance products, wellness programs and disease management services that can be used by individual network facilities. Employee benefit programs include a life insurance and AD&D insurance program, as well as a pharmacy benefit program for self-insured health plans. NCHN networks have also looked to Hylant for liability coverage such as D&O, property, general liability, medical malpractice, reinsurance and captive insurance consulting. Hylant’s Medical Risk Practice is a group of professional advisors dedicated to helping our healthcare clients find better ways to manage and finance risk, with the goal of reducing cost and protecting reputations and assets. We have experience and expertise working with rural health networks in developing successful group programs for property and casualty insurance coverage. The CROPS' Health Network Center is now offering Capacity Building Workshops (3 days) and we are seeking Telehealth Case Studies - especially ones in which Cisco, Avaya, and/or Polycom have been partners. We have our first workshop scheduled in northern Arizona (Four Corners Area) August 4-6, 2010 and I would like to have one Case Study to present in person, and possibly others via teleconferencing. Looking for a very dynamic presenter and well as a great story. We will pay travel expenses for one person to present in person. Interested members can send an email to me at info@ruralgrants.org expressing their interest with a short paragraph describing their success and qualifications to train. Article by Candi Helseth. originally published in the Spring 2010 issue of the Rural Monitor, a publication of the Rural Assistance Center. Two nonprofit ventures in Montana are proving that bigger isn’t necessarily better, especially when it comes to rural nursing staff needs.The Montana Health Network (MHN), serving eastern Montana, began offering a travel nurse staffing program in 2006 and Monida Healthcare Network in western Montana followed suit a year later. Travel nurse companies and recruiters place nurses in temporary positions, often in large city hospitals. While rural Montana facilities can fill temporary nursing slots using large travel nurse organizations, local travel nurses are more likely to understand the rural environment and are often available for shorter time frames than those centered in urban environments. Jill Domek, Vice President of Aging Services for two nursing homes in Glendive, Mont., says that MHN nurses provide a greater consistency of care. Having the same nurses return reduces staff’s time spent orientating temporary staff. Director sought to coordinate and supervise the activities of the Northeastern Rural Health Network, an eleven-member collaboration of the health and human service providers in Chesterfield, Dillon and Marlboro Counties in South Carolina. Excellent communication, supervision and knowledge of health care system is required. Experience working with executive boards, writing and managing grant programs and working with multi-organizational projects is preferred. Must be able to handle high degree of detail and manage several ongoing projects at one time. BS/BA degree required. If this describes you, please send your resume via e-mail to NRHNDirector@gmail.com. The workshop is one day from 8:30 am to 3:30 pm (about 6 hours) and 1/3 is health impact, 1/3 is community health engagement (planning), and 1/3 is health budgeting. Each participant will receive a packet of selected materials and a CD with all materials. In addition, Ann Peton will provide a one-hour training session on how to use mapping and spatial data analysis to further support the outcomes of the National Center. Professionals completing the workshop will be able to measure the economic impact of the health sector on counties, communities, or zip code areas in their state. Economic impact studies can also measure the impact at the regional, state, or national level. Join NCHN in a discussion of the Patient Protection and Affordable Care Act and how health networks can help with the implementation. Paul D. Moore, D.Ph., Senior Health Policy Advisor, HRSA, with the Office of Rural Health Policy and Carolyn Bruce, CEO, Western Healthcare Alliance. Dr. Moore, will provide information from the federal level and Ms. Bruce will discuss what is happening in 2010 and 2011 that health networks might respond to, with a look toward 2012 proposed activities. She will discuss approximately 12 areas of the legislation that health networks should pay attention to. There is no cost to participate; however, pre-registration is required to ensure that enough conference lines are available. To pre-register, please email dcomeau@synernet.net and provide your name and your network’s name. Debbie will then email you with the dial in instructions. Handouts will be distributed on June 11th to those on the pre-registration list. The Department of Health and Human Services (HHS) and Centers for Medicare & Medicaid Services (CMS) today invited states to apply for participation in the Multi-payer Advanced Primary Care Practice Demonstration, an initiative in which Medicare will join Medicaid and private insurers in state-based efforts to improve the delivery of primary care and lower health care costs. An Advanced Primary Care (APC) practice, commonly referred to as the patient-centered medical home, is a leading model for efficient management and delivery of quality health care services. APC practices promote accessible, continuous, and coordinated family-centered care utilizing a team approach and emphasizing prevention, health information technology, care coordination and shared decision making among participating patients and their providers. A new wesbite, sponsored by the Robert Wood Johnson Foundation and the Hirsch Health Law and Policy Program, has emerged and offers a number of helpful tools for Health Reform. The following articles are publications of Woods Rogers, PLC. They are distributed to Woods Rogers clients to alert them of how legislation will impact them. Thanks to Hemanl Marshall,III, (NCHN's 2010 Friend of NCHN Award Recipient) and Woods Rogers for sharing these documents with the NCHN membership. ORHP has moved … but not too far! The office is now located on the entire 10th floor of the “B” wing of the Parklawn Building in Rockville, Maryland. ORHP Staff are now grouped by division/team/office – Hospital-State Division (HSD), Community Based Division (CBD), Policy-Research Team (PRT) and Office for Advancement of Tele-health (OAT) – and there is additional conference room and storage space. All email and phone numbers remain the same. The ORHP Web site is also a much more attractive and accessible resource, thanks to a recent redesign undertaken by the U.S. Health Resources and Services Administration. Policy and research data, rural health-related resources and grant information – including information about grants in each state – are now easier to find and easier to use. HHS Secretary Kathleen Sebelius and Institute of Medicine President Harvey Fineberg today launched a national initiative to share a wealth of new community health data that will drive innovation and lead to the creation of new applications and tools to improve the health of Americans. The U.S. Centers for Medicare and Medicaid Services (CMS) proposed new regulations on May 26 in the Federal Register addressing the credentialing and privileging of physicians and practitioners providing telemedicine services in support of the current process used by many telemedicine programs. ATA is still studying the details of the rule. The rule appears to ensure that Medicare-participating hospitals will be able to credential and grant privileges to telemedicine physicians in a manner similar to the Joint Commission process. The new flexibility under the proposed rule would reduce the burden and duplicative nature of the traditional credentialing and privileging process for Medicare-participating hospitals and critical access hospitals that are engaged in telemedicine agreements, while still assuring accountability to the process. However, the proposed rule does not allow such a "proxy" process between hospitals and ambulatory centers and there may be other concerns. To avoid any problems in the interim, CMS also notified the Joint Commission that it may continue its existing "by proxy" credentialing and privileging requirements for telehealth practitioners until March 1, 2011 – by which time final CMS regulations should be in place. A copy of the proposed rule is available by clicking here (pdf). CMS will accept comments on the proposal through July 26. An additional $30.3 million is currently available to fund two additional Beacon Community cooperative agreement awards. Please note that the Office of the National Coordinator for Health Information Technology is accepting Letters of Intent from potential applicants until 11:59 PM EDT June 9, 2010. The Beacon Community Cooperative Agreement Program provides funding to communities to build and strengthen their health information technology (health IT) infrastructure and exchange capabilities. These communities will demonstrate the vision of a future where hospitals, clinicians, and patients are meaningful users of health IT, and together the community achieves measurable improvements in health care quality, safety, efficiency, and population health. The Program provides funding to communities at the cutting edge of electronic health record (EHR) adoption and health information exchange to push them to a new level of sustainable health care quality and efficiency. This program is anticipated to demonstrate how health IT can help providers and consumers develop innovative ways of delivering care leading to sustainable and measurable health and efficiency improvements. The program also will generate lessons learned on how other communities can achieve similar goals enabled by health IT. The National Rural Health Resource Center (The Center), previously the Rural Health Resource Center, is a national technical assistance and knowledge center based in Duluth, MN. The Center has a well established brand and reputation, and the name change is more reflective of the scope of services offered by the organization. The Center, incorporated in 1994, is a nonprofit organization dedicated to sustaining and improving health care in rural communities. As the nation's leading technical assistance and knowledge center in rural health, The Center focuses on five core areas: performance improvement, health information technology, recruitment & retention, community health assessments and networking. The Center is currently involved in a variety of federally funded and fee-for-service programs including: the Technical Assistance and Services Center (TASC) for the Medicare Rural Hospital Flexibility Program, Minnesota Web Recruitment, Rural Health Innovations, Delta Rural Health Performance Improvement (RHPI), Webinars, Consulting Services, and Conference Coordination. Recently, The Center, as a partner of Key Health Alliance, was awarded a Department of Health and Human Services grant to provide health information technology (HIT) technical assistance to clinics and hospitals in Minnesota and North Dakota. "The Center has established a reputation on the national level for strengthening rural health care," says Terry Hill, Executive Director of The Center. "The new name reflects the increased scope of work with rural health programs nationwide." On April 15, President Obama signed H.R. 4851 (The Continuing Extension Act of 2010) extending unemployment benefits and temporarily “fixing” the physician fee schedule problem (commonly referred to as the SGR problem). A little-noticed provision inserted into the bill also fixed a problem with EHR incentive payments that otherwise would have prevented thousands of physicians from qualifying for the payments later this year. When EHR incentive payments were originally approved as part of the Economic Recovery legislation passed last year, language in the bill excluded so-called “hospital-based” physicians from receiving these incentive payments. Although the language only specifically referred to ER physicians, pathologists and anesthesiologists, the legislative language gave the Secretary of Health and Human Services broad authority to exclude other “hospital-based” physicians from the program, whether they were practicing in an inpatient or outpatient setting. When the Secretary issued the proposed “meaningful use” rules for the EHR incentive payments this past January, it was clear that far more physicians would be classified as “hospital-based,” and thereby excluded from the program, than originally expected. By clarifying what types of physicians are classified as “provider-based” in H.R. 4851, Congress ensured that thousands of more physicians will be eligible for EHR incentive payments than would have been otherwise. In essence, the hospital-based exclusion will now only apply to pathologists, anesthesiologists or emergency physicians who provide substantially all of their services in an emergency room or hospital inpatient setting. Physicians who provide substantially all of their services in a hospital outpatient setting will be eligible for EHR incentive payments provided they meet all of the incentive payments requirements. CMS is expected to publish the final EHR meaningful use criteria in late June or early July. The new legislative directive will be reflected in the final rule. Description: The purpose of the Frontier Community Health Integration Demonstration is to develop and test new models for the delivery of health care services in frontier areas through improving access to and better integrating the delivery of health care to Medicare beneficiaries. The primary focus areas of the demonstration are the following: (1)Explore ways to increase access to, and improve the adequacy of, payments for acute care, extended care, and other essential health care services provided under the Medicare and Medicaid programs in frontier areas; (2)Evaluate regulatory challenges facing frontier providers and the communities they serve. HRSA will be funding this cooperative agreement to provide technical assistance and broad analysis of regulatory issues and challenges facing low-volume, frontier providers in the context of implementing the Centers for Medicare and Medicaid (CMS) demonstration authorized in Section 123 of MIPPA. Participation in the HRSA-funded activities does not guarantee participation in the CMS demonstration. Washington DC, June 1, 2010 – More Medicare beneficiaries will qualify for “Extra Help” with their prescription drug costs, and be eligible to pay no more than $2.50 for generic drugs and $6.30 for each brand name drug thanks to changes to Medicare’s Low-Income Subsidy Program (also known as LIS or “Extra Help”) that take effect this year. These changes make it easier than ever for people on Medicare with limited incomes to save on their drug costs. HHS Secretary Kathleen Sebelius today announced the availability of $51 million in Health Insurance Premium Review Grants through the Affordable Care Act. These funds are the first round of grants available to states through a new $250 million grant program to create and strengthen insurance rate review processes. All states and the District of Columbia are eligible for this first round of rate review grants. To receive a grant, a state must submit a plan for how it will use grant funds to develop or enhance its process of reviewing and approving, disapproving, or modifying health insurance premium requests. States with successful applications will receive a $1 million grant during the first round.